Now, the Good Queen never did have the slightest bit of restraint. I imagine most of you can think of times you have choked back biting, hurtful, self-evidently true words out of prudence, kindness or fear; there was never any such check on her tongue. Perhaps, too, there have been times where you have hidden your most vulnerable or outrageous feelings, times when you’ve wanted to share the very depths of your precious heart with someone and didn’t, or couldn’t. The Good Queen would not have understood such hesitation, and her passionate nature meant that you always knew precisely where you stood with her, whether she loved you, felt entirely indifferent to your very existence or was wondering why you hadn’t done anything useful with your wretched life, like feeding vultures. In turn, where she stood with other people was never of much concern to her: it was not so much that she had no feelings to hurt, for she was a creature of exquisite emotions, but rather that she valued her own feelings too highly to allow them to be affected by any of the ridiculous creatures surrounding her. In dress, too, she always did go in for opulence. That she could exist in a world where the rich gold cloth of this dress would turn thin white shows the depth of whatever pain or curse keeps her here; she never would have put up with it in life. Don’t try telling her you think it’s beautiful in its own way – she would have some choice words for you. Click for larger version (PNG): black, red; click for PDF version: black, red. Click here for the list of dolls. 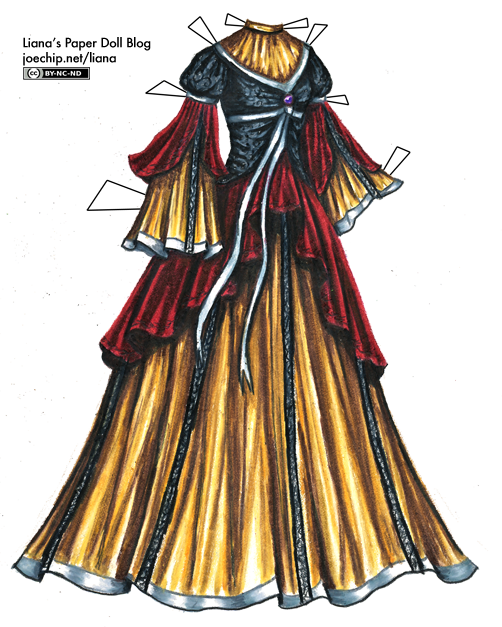 I don’t know if the other paperdoll bloggers would agree, but to me, Halloween is the supreme paperdoll holiday, so much that the thought of a month of costumes can pull me out of the deepest slump. In my humdrum real life I don’t like to be scared, and I don’t usually even bother slapping together a costume, but for Sylvia, Grace and company I’ve done some of my best work: poison-green masquerade gowns, cute ladybugs, scarecrows with real, entirely fearless crows. So let us celebrate this month together: we’ll enjoy closets full of imaginary costumes and, I hope, a couple of good stories to go along with them. 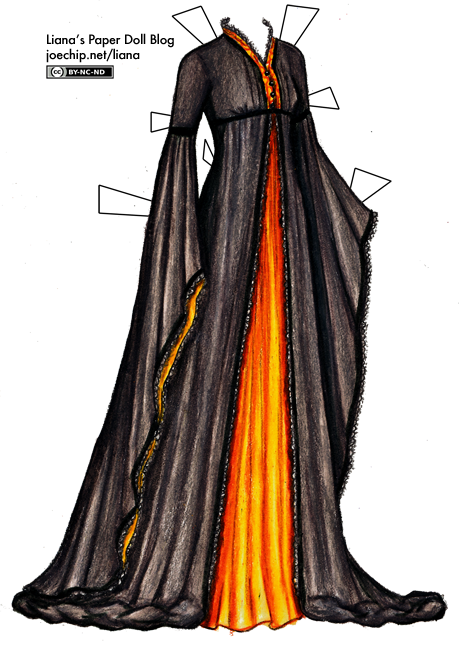 I shall be the High Priestess of Paperdoll Halloween, and sacrifice dozens of Prismacolors to the pencil sharpener! And here is what I might like to wear for such a job, had I but fabric enough and time. 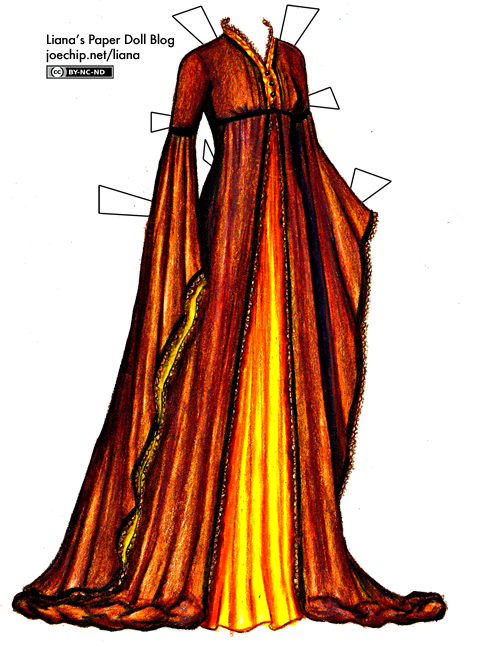 I myself may be a capricious and unstable sort of high priestess, but the patience of the multitudes touches my heart, so I offer a psychedelic sort of red version of today’s outfit as well. Colors used: black, warm grey 10%, 50%, 70% and 90%, dark umber, sunburst yellow, goldenrod and pumpkin orange. Do me a favor and remind me not to anthropomorphize my colored pencils. There’s a reason I never use my Warm Grey set, and it’s that they’re just too darn dark! I’m under no obligation to be fair to my Prismacolors, otherwise you would see a lot more Salmon Pink and Muted Turquoise. So I’m sorry that this wedding dress is a touch too grey, even though I started it fairly early in the day I didn’t have enough time to redo it by the time I realized it wasn’t quite what I wanted. 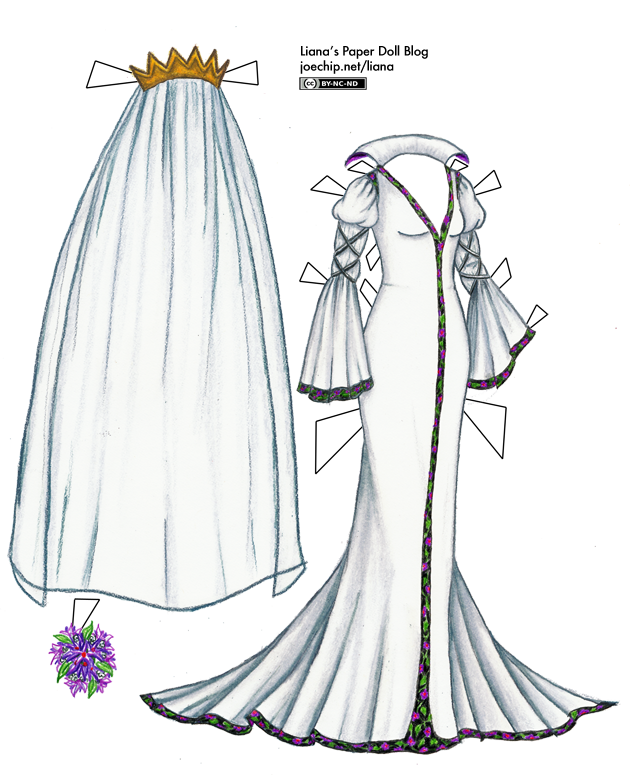 Also, I didn’t have enough time to do the veil and bouquet either, and now I am rushing to post at least the dress before we possibly lose power. I will do them tomorrow. 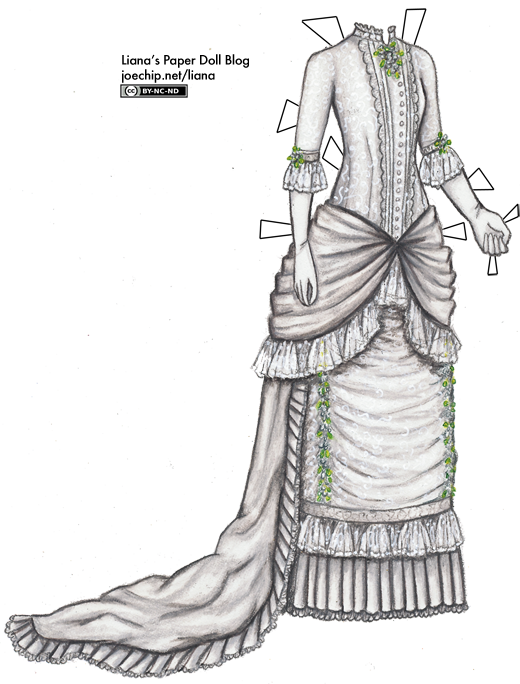 Anyways, this is an 1882 gown, and I like it despite the fact that it’s a little bit too grey… I’m quite fond of Gilded Era gowns, even if it’s unwise to try to finish one in a single day. You may or may not have seen this, but there’s a line of wedding dresses based on the various Disney princesses. You can probably guess that I’ve got a soft spot for Ariel and the gang, and I’m certainly fond of my pretty princess gowns, but it seems to me like something was left out… The fact is, it’s the villains who deserve the most spectacular wedding dresses! If you really think about it, theirs ought to be even more wonderful than any ever made for your standard issue simpering, vacuously beautiful princess. I mean, wouldn’t that be part of the joy of being a villain? You don’t have to worry about looking modest or maidenly, frugality isn’t even in your vocabulary, and if anyone out there gives you static about your wedding colors or where you have your registry, well, darling, that is simply the kind of situation that pet dragons, leftover poisoned fruit or comic-relief henchmen were created for. Now, I don’t really think you could package this up and sell it to a modern audience. Why? They couldn’t handle all this fierce in one dress, that’s why. For most humans, it’s probably better to stick with an imitation of Cinderella or Belle. I’m not entirely sure that this is small enough to print on one page – so if you print it and it doesn’t work, let me know and I will fuss with it. (It’s almost 11 PM, so I’m rapidly running out of patience…) Also, I think the collar would be tough to cut out; I think you would have to cut between the doll’s shoulders and neck and her hair, and then you would cut a line straight through the middle of the collar, so the collar would slip behind her neck. Or cut off the collar entirely, I won’t hold it against you. It won’t seem as evil, though – some sacrifices must be made to achieve the proper look, you know.